Disclaimer: This is not my family. This family is way more attractive than my family. So the summer is upon us, and it looks like we’re going to be spending a lot more time outside. I’d like to stay in and watch DVD box sets or play on the Playstation, but my wife tells me that the kids want to go out and enjoy themselves. Translated from the female language into the male language, that means that she doesn’t want to watch the back of my head while I thrash the latest video game bad guy. The kids love games as much as I do, so I know the real reason. Unfortunately God gave me a conscience so I figured that it would be better for all of us to get out and do something. Well, better for me really. I guess a good place to go in the summer time is somewhere wet. We live near the coast, but the sea isn’t quite warm enough yet, so the pool was the next best thing. I love a good swim, the kids love a good mess around in the pool, and my wife is just happy to do something as a family. That’s the trouble with women; they have all these family values and great big ideas about how they can get us all to bond. Anyway, I decided that the pool would be great, but I wanted to chill while the family was going nuts. I also wanted to have a pool to myself, so we hired one. Seriously, there are a lot of rich folk out there that are willing to rent out their pools. Prices vary, and so do locations, but you can get a great situation where you and your family can get a pool all to yourself. We spent a few hours there and a great time was had by all. I had an especially good time. This place had a selection of inflatable loungers. I enjoyed the facilities, and when I got home, I decided to share with you guys. Here are the best loungers that they had. It took some time to track this down. I knew the brand but not the name, but I eventually figured it out. 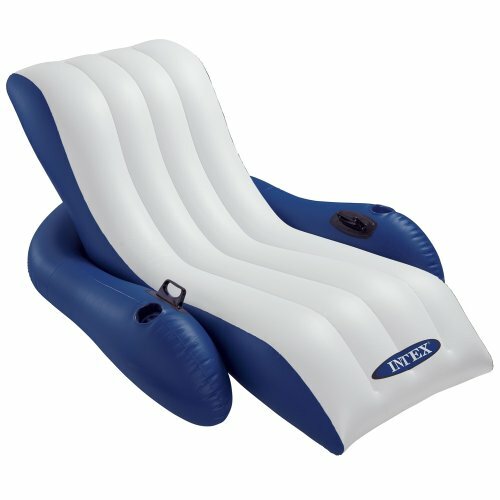 The Intex Sit n Float Lounge is a great lounger, but I’m a grown man. I initially went to it because of the cup holders. The people we rented the pool from asked us not to drink in the pool, but I figured that if the lounger had cup holders then I’d be allowed. After all, they were probably referring to the kids anyway right? As I said though, I’m a grown man, and the Sit n Float didn’t really support me that well. I switched and my wife got in it. She has a lot more grace and elegance than me, so it suited her fine. My natural adventurous character then led me to the River Run. This thing looked like it was built for action, and for a moment I forgot that I was standing in a waist deep swimming pool in some stranger’s garden. I waded over to it day dreaming of white water rapids and alligators. I jumped in and suddenly realised that the River Run was really hard work. I wanted to chase the kids around, and that meant lots of arm flapping and plenty of water all over the place. On top of that, the kids figured that they’d make it their life’s goal to tip me out of it. I can’t blame them, they’re my kids. If they were sitting in it, I’d be tipping them out too. 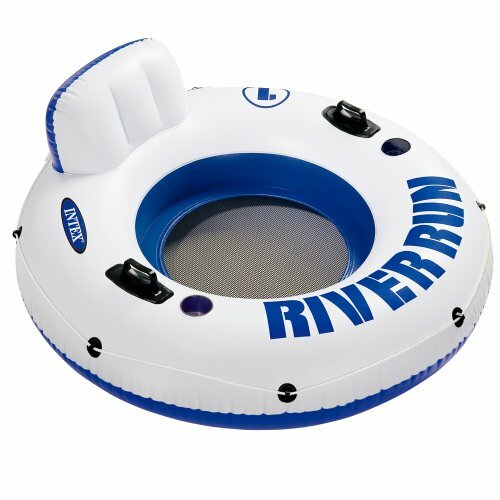 I ditched the River Run after plenty of horse play, and I went for the last inflatable in the garden. 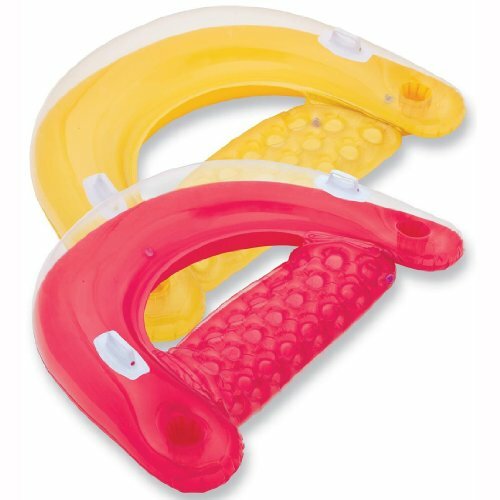 It seems like Intex have a monopoly on inflatable pool chairs as the last one was made by them too. I’d never heard of them until then, but if I ever hit the lotto I’m going straight to them to stock up ready for my Olympic sized mega pool with dive boards and wave machine. Anyway, the last one was called the Intex Floating Recliner according to Amazon. I stayed on this one almost for the rest of the day. It’s a real daddy’s chair. It was comfy, robust, and had two cup holders. My feet dangled off the edge so I could propel myself around, albeit in reverse. It felt strong too, so that was another tick in the man box. There was only one small issue that I found with it. The back was fairly high, so the pesky kids could dive under the water and sneak up behind me. That meant a couple of unwelcome near drowning experiences before I put my angry hat on. If you buy one, and you have kids like mine, then you’ll have to remember to pack your angry hat too so you can scare the kids off too. They’re so gullible; they really believed that I was going to sell them on the way home so that I could buy daddy soda. Am I a bad father? So that’s my experience of these loungers. I really wish that I could have taken the sporty one out for a real test, but real life often gets in the way of childish dreams. If I were the kind of guy to buy my own pool toys then I’d certainly want the last one. My wife is, however, the boss, so in reality if I got the card out, you’d better believe that we’d soon be the proud owners of the Sit n Float Lounge. It’s all about compromise. Oh, and I love you honey.